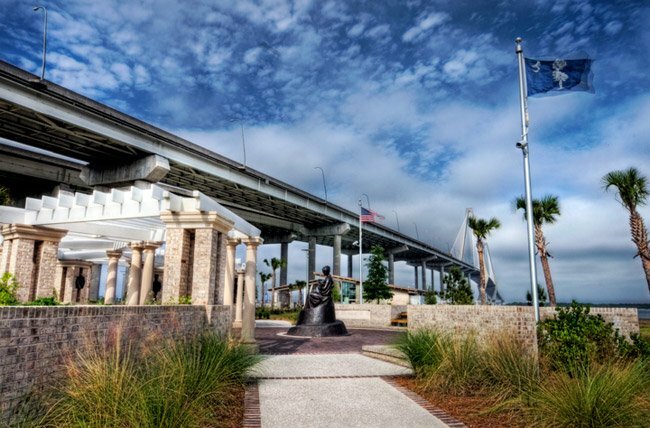 The Memorial Waterfront Park, located beneath the foot of the Ravenel Bridge along the Cooper River in Mount Pleasant, brings history, recreation, and nature together in one place. 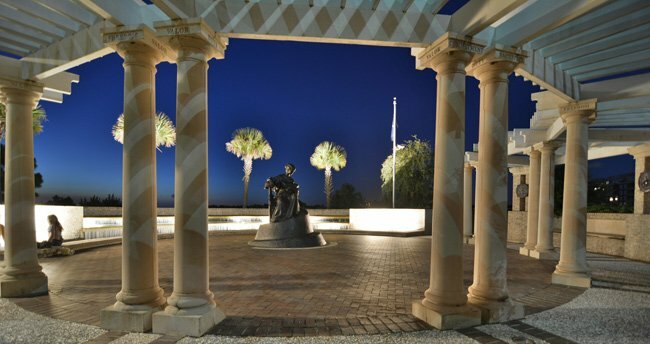 Along with the war memorial itself, visitors will find a large pier with a tackle and gift shop, a playground, an open-air sweetgrass basket pavilion, and lots of green space. 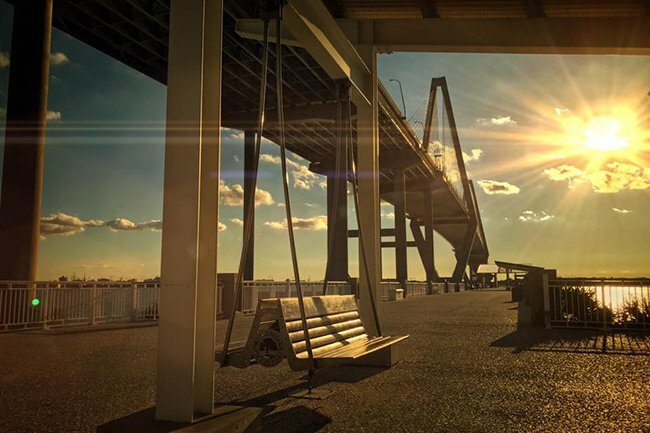 The park features the 1250-foot long Mount Pleasant Pier that extends into the Charleston Harbor for stunning vistas of the river. The pier is made of pilings from the Silas N. Pearman Bridge and provides a leisurely stroll along the water. A covered pavilion sits along the pier and is available for parties and events. 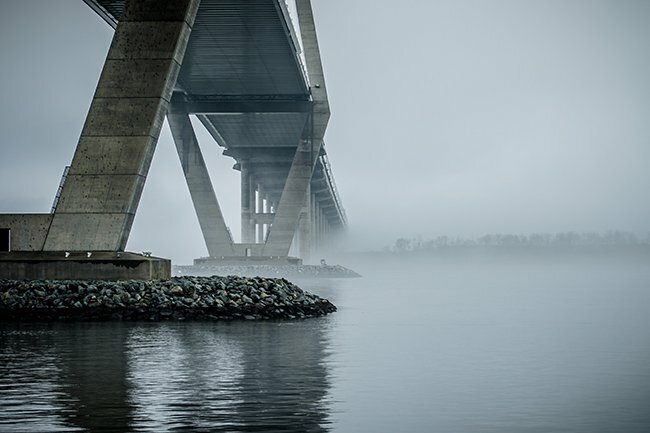 Underneath the bridge offers visitors the opportunity to rest for a while and take in the beautiful scenery. 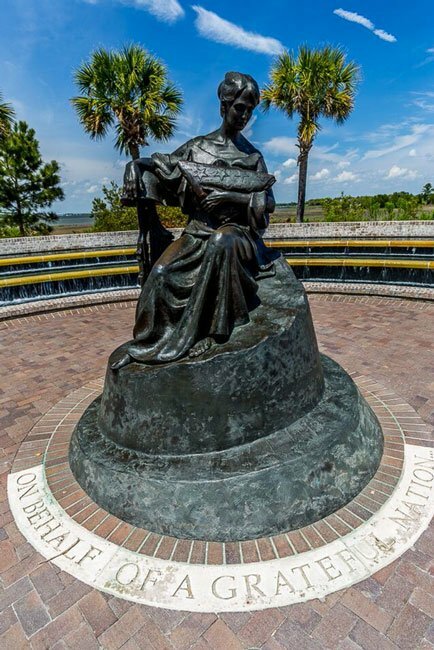 The below statue is the centerpiece of the Memorial Waterfront Park. 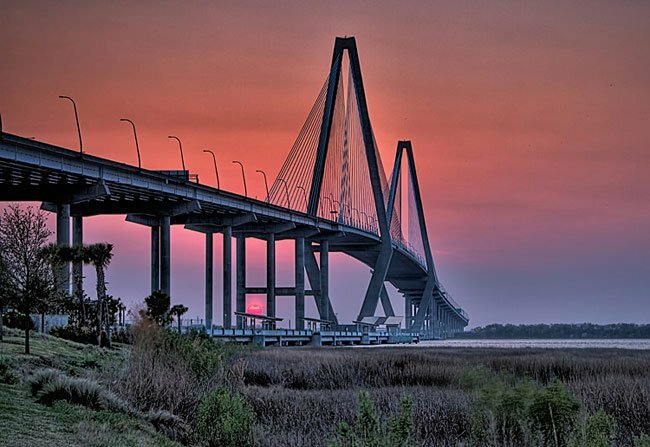 The park honors local war veterans and has stunning views of the Ravenel Bridge and the Cooper River. As one approaches the pier, the war memorial pictured above is to the right. The names of dozens of local war veterans who were killed in action are displayed alongside the sculpture, which depicts a grieving woman holding a folded American flag in one arm and resting her other arm on a combat helmet and rifle. When is the sweetgrass pavilion open? Need two baskets repaired. Have stopped three times and nobody there and no signage re hours. I’m getting ready to do a research paper on this statue; it’s fascinating. I’ve found out that the sculptor hired for the project has done a lot of work in the mall of Washington D.C. So proud to have something like this in Mt. Pleasant! My younger brother worked on the construction crew that built the war memorial. He made the forms and poured the concrete columns. We are from Michigan, and he told stories of working here. He LOVED it! He loved the sounds of the cars on the bridge, and the warm sun on his back. I was fortunate enough to visit in 2009, and the stories my brother told suddenly made sense. My husband and I can’t wait to visit again this summer. My brother was killed in Moncks Corner December 2008.